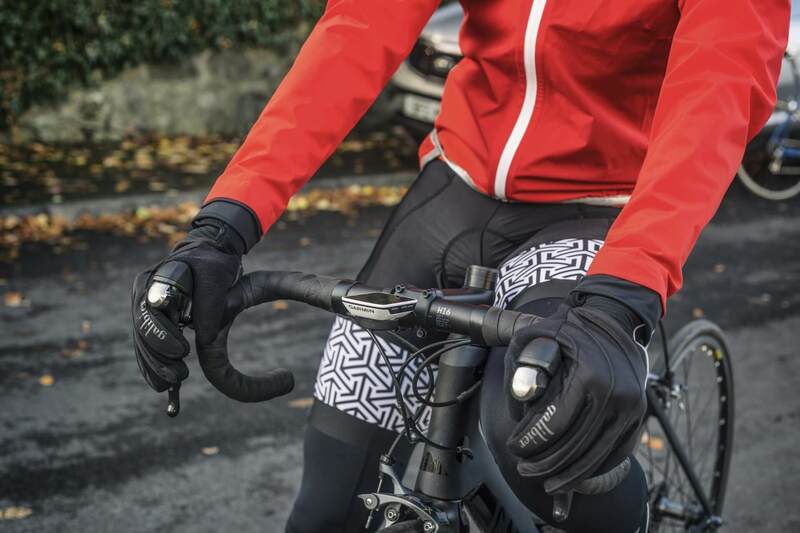 A fully waterproof jacket for cycling when it is raining or rain expected. The structure of the jacket is the material. Nearly 3 square meters of HydraStop membrane is used in each jacket. 9k/8k*. An honest, durable waterproof fabric. We designed a stunning stylish cut and added visibility. Smooth, sleek and will keep you warm and dry in the worst conditions. Taped seams thru out and doubled stitched for durability. Storm proof zip and high collar to keep you protected when the skys open. Can be worn over a base layer in spring and summer. Add a long sleeve jersey and can be used as a jacket replacement in Winter. This is our Fourth generation of this rain jacket and riders love them. Please consult the size chart as the fit is designed for little flap. *Manufacturers typically describe the waterproof/breathability of each fabric by using two sets of numbers. The first number, in millimeters (mm) represents how waterproof the fabric is. This is 9000 or 9k. The second number represents how breathable a fabric is. This is expressed in grams and represents how much moisture vapour (warm air/sweat) can pass through one square meter of the fabric (from the inside to the outside) in 24 hours. 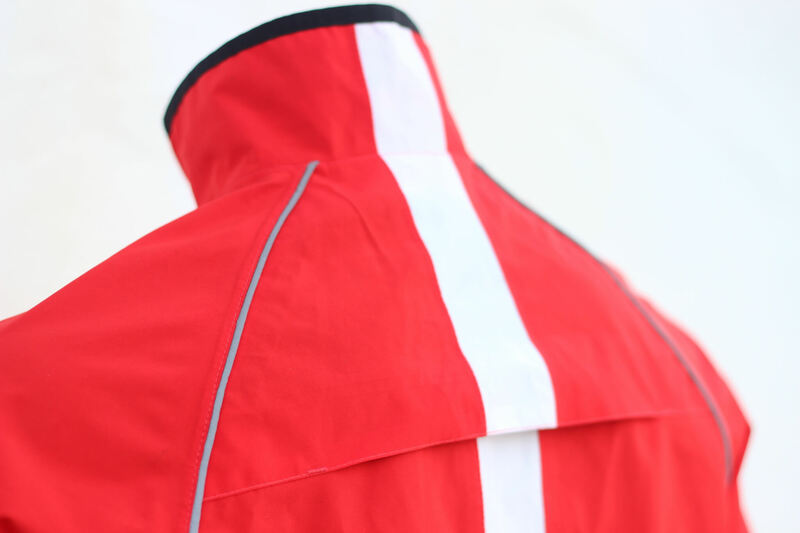 Tourmalet jacket from galibier velo on Vimeo. Long splash tail- right to the saddle . Easy pull, (even in gloves) no snag, zip. Durable, as usual we stand over ALL our products. The garment is fitted, If you want a relaxed fit, or wish it to go over a winter jacket, we would advise to size up, from normal. ‘Im 32″ waist and 38″ chest and the medium is a super fit over a short sleeve jersey’ Mark. Never written a review before. Unreal jacket. Just back from a ride and got caught for the last hour in a storm. This works! And no soaking clothes so it is breathable. Very impressed Galibier . I’m really pleased with this jacket. It’s stylish, fits very well and little details like the double cuff and rear zip for access to jersey pockets are very well thought out. Rain protection is very good and I can fold it down for storage in my jersey pocket. Have worn this jacket 4 or 5 times in Dec in west kerry in driving rain and wind. It’s the best piece of kit I have had in years. Couldn’t recommend it enough. Great jacket, keeps you completely protected from the rain and perfect for the back pocket. Immense. My best piece of kit. 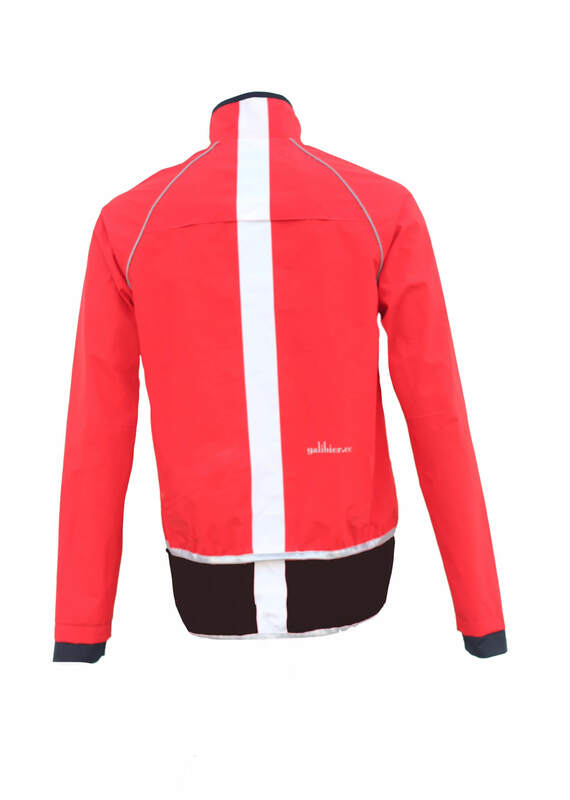 The Team at Galibier are missing a big plug here, not only is this one of the best waterproof jackets around, also cannot be beaten as a wind stopper, this comes directly from being worn extensively throughout the Scottish winter with a base layer and long sleeved Jersey, nothing else required, has made my winter jacket redundant!!!!!!! Now spring is here I thought I would add a longer term review. This jacket is a superb piece of kit. It has seen me through a typically cornish winter, with 50 types of rain. Warm drizzle, cold mizzle, Atlantic gales and spring breezes. Full gas, endurance, rolled into the jersey when the sun shows midway. My tourmalet has been with me through it all, and has performed in it all. Starting with my tourmalet, I look out the window and decide what is going under it. Baselayer only when going hard, long sleeve jersey when it is really cold, short sleeve when I’m feeling optimistic. All the while I look stylish and feel comfortable. Thanks for all of the comfortable winter miles! Best rain jacket I have ever used. First jacket I have used that I have not felt like I’m boiling in a bag. Did a hilly 70 miler in the rain last weekend and never felt over cooked once. Great fit and very handy zipper at rear for getting into jersey pockets. Long sleeve base layer and short sleeve jersey is all you need for underneath. Went out on Monday and got caught in the most horrid of weathers, 30 mph +winds, heavy rain and to top it all hail stones. Was wearing my newly purchased jacket and all I need to say is wow…!! I have never returned from a 60k ride where I have felt completely comfortable and dry(top half at least). I would seriously recommend this as a necessary purchase to anyone looking for a serious bit of kit and the price makes it a no brainier…. Couldn’t do without this jacket. I ride about 15-20 hrs a week all year round, all weathers…if it drops below freezing I still do my 4 hour rides but wheel out the mtb instead of the road bike. The jacket has seen all weathers and if I didn’t have this piece of kit there is no way I’d even think of going out in some of the atrocious weather we get. It keep you warm but doesn’t overheat if paired with the right layering. It also is the best thing I’ve found at keeping me dry. It looks good to boot and tight fitting but enough room for layering when needed. 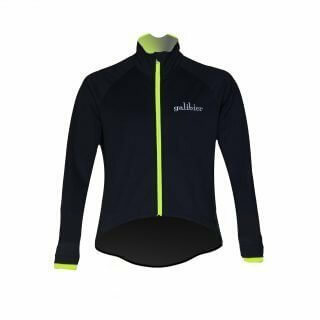 Galibier have been super quick on other items when I’ve needed to swop sizes, great service. Simply the best cycling jacket I’ve purchased. Its had daily use in the Welsh hills over the last few weeks, keeping me dry and comfortable, the breathability is excellent. This could be twice the price and I’d still give it 5 stars. After riding home from work in a storm the clothes underneath the jacket was still dry. 10 out 10 for comfort and fit, I am not a big fan of black on a road but have to give this top marks for performance and delivery was great. Got this jacket December 2014 as a Christmas pressie, has been worn many many times since then, have covered about 7000 mile in this time. Feb 2016, 2 hr ride in heavy rain driven by 15 mph wind at -0.5 2 degree celcius. Functions as good now as when new, wind protection is awesome as is the waterproofing still, beading of water stops after about 45 min in these conditions but doesn’t come through, internal taped seams still as good as new. This is testament to the care taken on developing the garment add it clearly stands the test of time. I reviewed a number of jackets before purchasing this one, the positive re-marks swayed my decision, and it hasn’t let me down. Great fit, stylish, well designed, constructed and great value. I use it to commute and weekend rides, definitively a place in by cycling drawer for more Galibier clothing. Very pleased with this jacket. 45 minute commute in persistent heavy downpour and still dry when I got to work. Super fit, smart styling and great value. Wore this jacket during a gran fondo race, 10hrs on the bike, of which 3 hours in torrential rain. never felt cold. Kept me warm in descents, easily off in the valleys, high cuff is really comfy. In winter wore it with a light jersey underneath. perfect jacket! Had a nasty crash during a descent, only minor arm wounds due to the strong fabric. Will order a new one immediately. 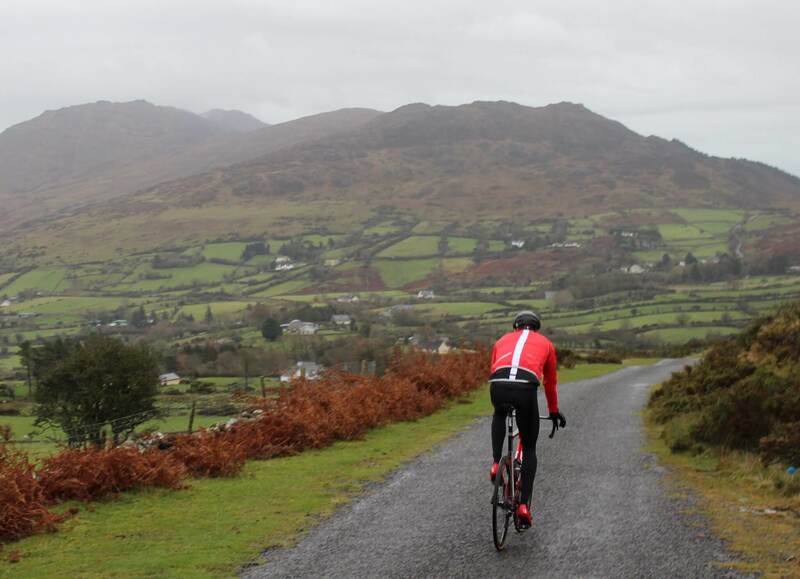 Purchased the Galibier 7k/4k Tourmalet Waterproof Jacket several weeks ago, and was looking forward to wearing and testing it out in the foul weather we had a few days ago. I spent 6 days cycling North West highlands, The jacket is 100% windproof, breathability, I’m unable to comment as I sweat buckets, In torrential rain you will get wet, as I did with 12 hours of cycling. 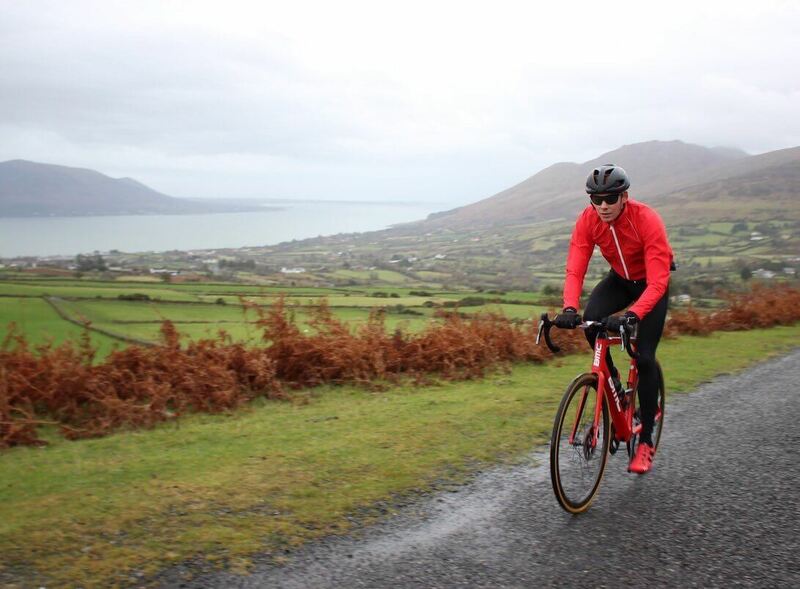 In light rain, showers, etc and to keep the wind chill off I would definitely recommend… You will not be able to purchase a quality jacket like the Galibier 7k/4k Tourmalet Waterproof Jacket. This jacket is in the same league as the Castelli Gabba at a fraction of the price. I’m more than happy with the jacket, that I’m about to purchase the Mistral foul II weather Jacket, and the Colombière Winter jacket to my collection. God decided to pour buckets of water on my head for 6 days straight whilst I was cycling the north coast of Scotland. Even God himself couldn’t make water wet enough to get through this one. Galibier 1 God nil. I wanted not to like this jacket. Why? Because at this price, it couldn’t possibly be any good – could it? Having taken the plunge and ordered it – because lets be honest, it’s properly inexpensive for what it claims to be – I was pretty impressed to receive in the post the next day. Trying it on over a t-shirt, I was genuinely impressed. Good fit, high neck, decent back length, comfy cuffs and the fabric and general construction oozed a quality that exceeded my expectations significantly. The first time it was used ‘in anger’ was in the French Alps. Despite heavy, driving rain, this jacket absolutely nailed it. It fits in a single jersey pocket (not entirely, but the bit that will protrude from the top just renders it easier to extract! ), is relatively light – certainly light enough to not appreciate your are carrying it – and, most importantly, is absolutely waterproof. Breathability is every bit as good as you’d want on a cold, wet day too. Having previously owned a DHB eVent jacket that was lighter but nowhere near as robust as this, yet nearly twice the price, I can honestly say this is one of the best pieces of cycling apparel I have ever bought and at the price, will leave you questioning why Assos et al can charge so much when the quality is not significantly better? My only gripe is that it could do with a zip pull to aid adjustment of the zip but that is easily fixed. This is a must have for anyone in the market for a good waterproof jacket. Best just got better with the new updated version of this wonderful jacket. Have the previous model and it’s still going strong. 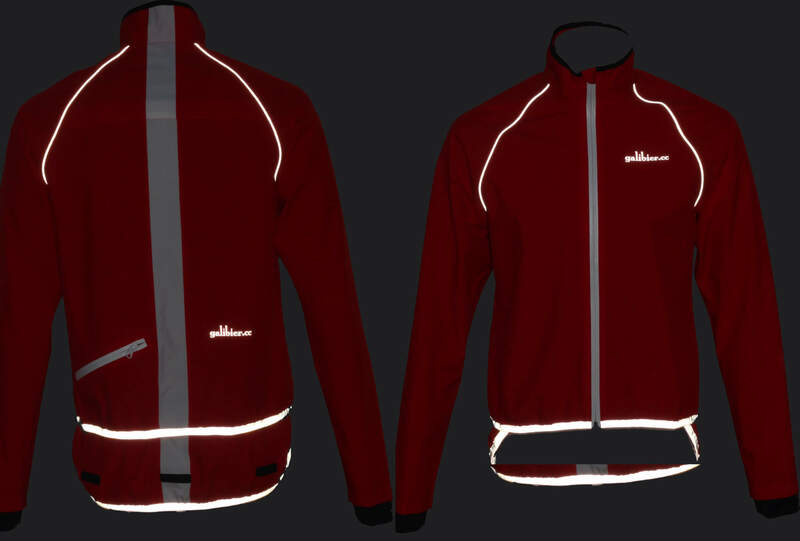 Original quality added to this new bright red colour and excellent new spray tail feature make this a must buy jacket. 2 hours ride in the rain today and bone dry. Top marks Galibier. Just got back from an hour and half ride in intermittent February rain – quite cold and definitely wet. The jacket worked as I returned warm and dry :-). My well known make commuter jacket would have been pretty damp inside after the same ride but the Tourmalet was nice and dry. TBH, my base layer was a bit clammy but that is a small price to pay for the protection offered. The jacket looks great in racing red with a go-faster stripe and the chest sizing is spot on although its cut will not suit those who like pies! The sleeves are long and the cuffs work brilliantly My only gripe is that it is a bit short for anyone over six feet tall. 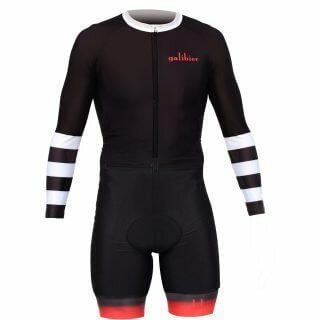 Overall this is a great piece of cycling kit that would be hard to beat at any price – well done again Galibier. 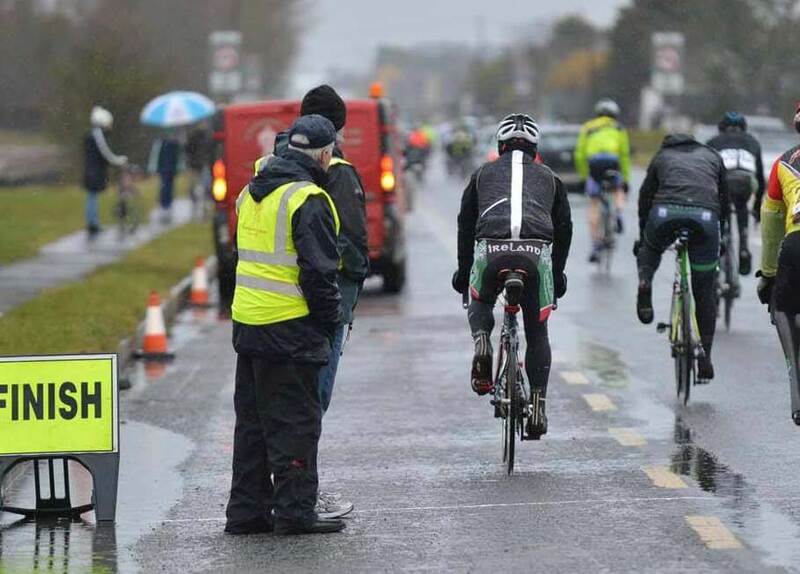 Rode the Mad March Hare Sportive on Sunday in torrential rain for the first hour. First time out in my Tourmalet Rain Jacket. Took it off half way and I was bone dry. Pound for pound the best cycling apparel I have ever bought. Cannot recommend this jacket enough. Told all my club mates after too. Chapeau! Fabulous jacket, kept me warm and dry on a very long, wet and cold ride in March. I am 1.93 and 94kg, the XL was a very good fit. Enough room for a base layer and Jersey underneath but not much more. Notwithstanding, those three layers were enough to keep me warm at below 5 degrees C in a driving hailstorm. Superb jacket for the wettest of days.Have wore this through a tropical downpour and stayed dry.Perfect collar shape is fantastic and the sliding cuff is brilliant.This is now my favourite piece of kit.Very light and good venting if paired with a baselayer only. I received this jacket last week and managed to give it a pretty full on test today. I ordered a large, I have a 98 cm chest, am 178 tall and weigh 76 kg. I have spent 4 years living and cycling in the French alpes and the last 18 months in the Pyrenees and have had many combinations of foul weather gear. 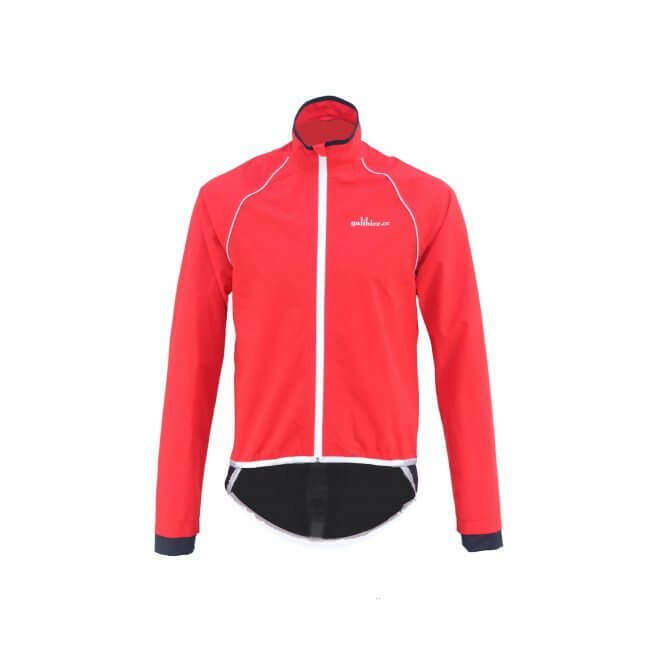 On reading all the reviews on the tourmalet jacket I decided this one was interesting. When I tried it at home, I felt that the cut on the chest was a little on the loose side and wished that the front was cut a few cm’s higher. I would have prefered maybe to try a medium, but it wouldn’t have fitted in the shoulders. The day before I tried it, I visited Jorma bike in Andorra and tried the gore bike wear 1985 jacket, it was sublime in every way, incredible fit, super light, amazingly small when packed down and 300€!! So I can forgive the tourmalet for being a very slightly inferior cut and also commend it for being over £230 cheaper! I secretly wanted the galibier tourmalet to fail so I could then buy the gore 1985. So, today I rode 80km, climbing 2500m. I wore the jacket in dry conditions for the first early and cold descent of 7km and it was perfect, totally windproof. Once I began climbing,the jacket, though not the smallest, did fit into my rear pocket. I was in a full aero race fit jersey but managed to stow the jacket and carry arm warmers,buff, gloves, cap phone and enough food for the ride. The real test came on the final climb. It began raining steadily. I put it on at 15°c and climbed the last 10km and 870m vertical. It was 9°c at the col. All the time I remained comfortable and dry, the jacket always shedding water with ease. So was I happy and surprised by how it performed, yes and yes. The jacket at far less cost than most had performed beyond all my expectations. Can I forgive the small issues with the cut? Yes absolutely, especially when I would have to pay many times more for the perfect fit. Do I regret not buying the gore jacket, not at all!! This thing is insane. Recommending this jacket to everyone in Australia. Stop thinking about it. Just buy one. When it’s lashing down, and you’re out on your bike, you will be so glad to have this jacket. End of. Great looking, great fit (you could race in this jacket), comfortable technically sound rain jacket that keeps you dry when it rains. You wont regret buying this jacket. I’m 5’10″97kg and 44″ chest, ordered XXL… perfect fit. I love the drop down rear panel that protects my rear end when no mud guards are fitted. I bought this jacket just before winter rains set in. I have had many rain proof jackets in my time but this by far the best I’ve ever had. Very waterproof,lightweight and stylish. I also use this top go running in, just use the handy velcro tabs at the back to fold up the tail. Every running jacket I’ve used I am usually just as wet inside as out but not in this one. 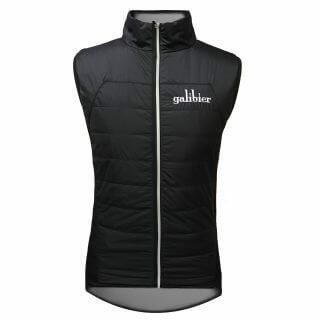 Brilliant gear from Galibier will be buying plenty more clothing from them, best bang for buck on the market. I’ve only got into cycling the last few months (commute to work) – and this was my first proper item of cycling clothing purchased. I finally had my first day cycling in the rain last week – and this jacket was perfect. Very comfy to wear and it looks the part too. Most importantly it kept the rain out. Excellent jacket for the price, wore it on a recent club spin where it rained throughout, kept me dry and also warm without being a boil in the bag, I’m 6’7″, slim build and got the size large which is a good fit on the bike, I’d have no hesitation in recommending this jacket, great bit of kit. -Worked for example very well in a day long 215 km tour with constant downpour in ca. 8-11C. -Well thought out and very good reflecting material for visibility and safety. -Way too hot for New York City summers, but for fall through spring it is my preferred cycling clothing when there is a chance of rain. For me it works best in ca. -2 to +10C temperatures. -On colder days work with different underlayers for comfort, such as merino wool. -At times I wouldn’t mind an underarm zipper for better breathing. -Ran a bit tight but has long sleeves for added protection.